With regards to launching a company, there are several steps to take, all of which are important for individual reasons. Selecting a company name can be an either very difficult or hard. If you fall into the former category and are trying to pick the right name, you don’t have to do it alone. Prior to moving ahead, we want to know if you’re in search of a corporate identity and logo for your company. If so, you can use the Logaster logo maker, which you can check out here. No technical skills are required to create the logo of your dreams! 1. Clarity: Don’t confuse people. Your brand name’s feel and sound should imply what the company entails. For instance, if NomNom is the name of your brand, this is suggestive of something edible. A provider of financial services should not use the name NomNom, though. A hybrid of relevant words will stimulate your mind into formulating a relevant name. 2. Descriptive: Ensure the name sells the identity of the brand. The brand name shouldn’t just be clear, it should be descriptive, too. The name should convey the identity of the company, as well as its objectives, approach, and attitude. Don’t just insert a service or product word in the brand name. Rather, capture the brand’s experience, essence, and benefits in a suggestive or oblique manner. 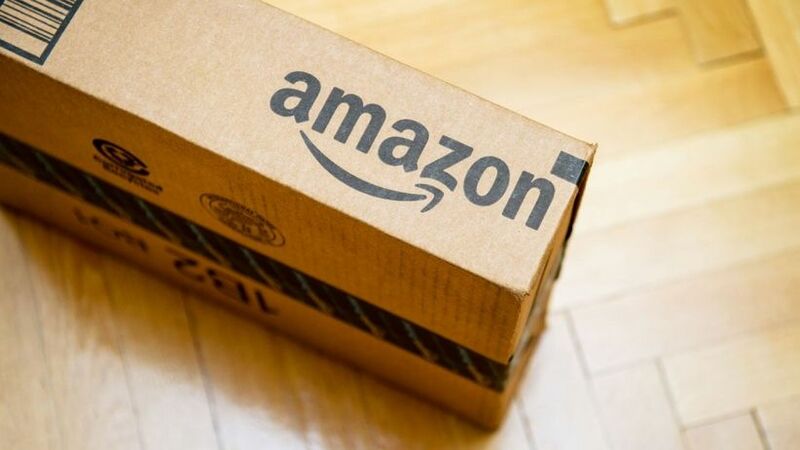 For instance, Amazon selected a name that connotes huge expansion and all-encompassing service. 3. Unforgettable: It must be simple to remember. One of the human mind’s faults is that it’s terrible at remembering names. This is because the brain keeps names in its working or short-term memory only. In regular life, our working memory can be compared to our laptop. It stores the details we are working on actively for a set duration, but the system inevitably crashes with too many programs running at once. We forget things because our working memory isn’t able to monitor all things at once. An unforgettable brand name should challenge the mind’s easy-in/easy-out tendency. This can be achieved by pairing the brand name to a feeling, sensation, or attitude. There are several kinds of memories. Your brand name can touch on a couple of different memory types, perhaps an emotional memory and physical sensation. In doing so, the mind is more inclined to remember the name. – Keep it brief (discussed below). – Make sure it’s one of a kind (discussed below). – Use recognizable sounds or words. 4. Brief: It must be simple to remember (part 2). Scientists claim that the mind can’t maintain an abundance of data all at once. While the mind’s capacity is essentially without limits, it still endures the issue of processing, storing, and retaining specific batches of details at the same time. Don’t overwhelm the brain with too many details. A short brand name enhances speech fluidity, memorability, and catchiness. IBM, Uber, Apple, and Buffer are shining examples of short brand names. 5. Easy: Make it simple to spell. Refrain from attempting to be funny by coming up with a misspelled word as a brand name. This will only result in confusion and illicit negative memories, both of which will trigger an adverse reaction. However, if the word is misspelled to the point where a new word is created in the process, you might have stumbled onto something clever. For instance, Hipmunk is a brand name that is clearly misspelled but doesn’t warrant any expectations or violate traditional grammar rules. 6. Trends: Stay away from outdated recommendations. To resonate with trendy individuals a brand name needs to have a stylish vibe. Just don’t go overboard trying to be trendy – what is popular today could be outdated next week. You need a name that will stand the test of time. Try isolating domain names that are available and select one based on your criteria. This isn’t as mandatory as it used to be, as brand signals and SEO have come a long way over the years. You are encouraged to select a domain name methodically, but don’t compromise it based on what’s available. 7. Uniqueness: company name must be special. Your brand name must be one of a kind for sensory reasons. 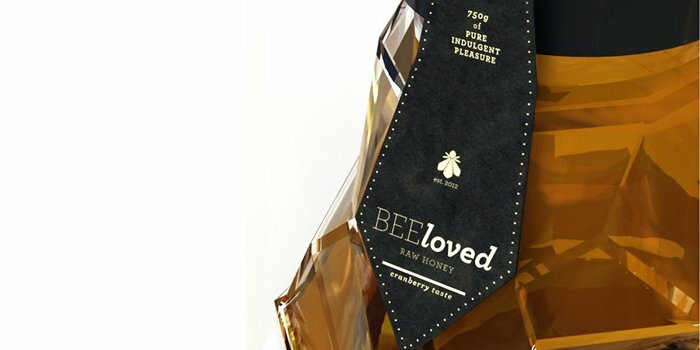 Assuming it’s not too out of the norm, a unique brand name can linger in people’s memories. The business incentives for a unique brand name are compelling. When a company enters the market, it’s competing for a specific audience’s attention. Failure to do so results in the company being dead in the water from the get-go. 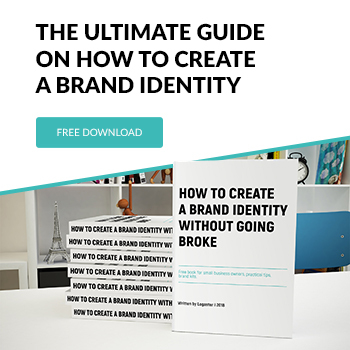 Also, while brand signals rise in the digital marketing space, the existence of the brand is contingent on its unique identity. If you select a bland word like “hammer” or “spark”, your rankings won’t get any higher on search engine result pages. You must make your brand name stand out by creating a whole new word or a mix of words that are short, simple, and memorable. 8. Eye-catching: Your target market should connect with the brand name. An appealing brand name is not something you should take for granted. Instead, it should appeal specifically to an intended audience. Therefore, to develop an ideal brand name, you must first think about who you’re attempting to reach. What language do they speak? How old are they? Do they have style preferences? What is their income level? Their level of education? Their sophistication levels? Their religious beliefs? Their overall interests? Their brand of choice? 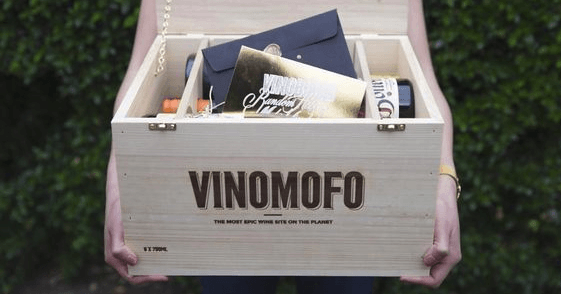 Visualize the VinoMofo brand. It focuses on the progressive, millennial, hipster demographic. Refrain from selecting a standard, rudimentary vocabulary word. Uber gets a pass since it’s not a common word. You can give Apple a pass, too, based on how large of a company they are. Create your own word, like Portmanteau. Think of your brand name as a product. It will need to convey the intention, value, and identity of your company. When you can make a connection between your brand name and your target market successfully, you’ll accomplish great appeal. 9. Enduring: Bigger than just your name. It would be great if your brand outlives you. A brand can leave a revolutionary impact on a generation. This likelihood is less so when the brand is inextricably linked to one person. Consider picking a name that can live on with or without you. Walt Disney is an exception to this rule. Once in a while, company owners will select names with silly words (Google, Yahoo, Fogdog), or names picked out of the ether that are trademark-proof, which are particularly risky. Keep the international implications in mind. Several companies have chosen names with offensive and negative connotations in a different language. Add some words to this company name generator, and it will produce a list of potential handles you can use for your business. The tool can also determine which relevant domain names are available. It’s very simple to use Shopify’s business name generator. After you enter a keyword to search for, you’ll be exposed to several options that may be relevant to your niche. It’s much easier to think of a great name when you have several choices handed to you than it is to try to come up with one by yourself. 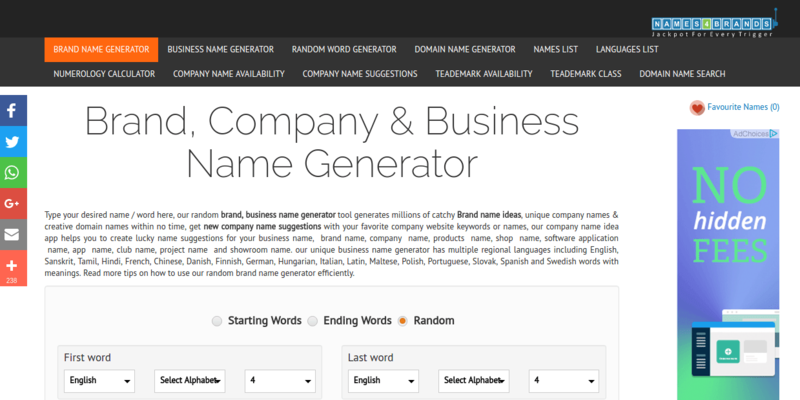 Names4brands business name generator provides you with a bunch of tools to help you pick a suitable company name. With regards to choosing the amount of words to use, the average number for branding purposes is two. However, don’t feel like you need to limit yourself to a couple of words to name your organization. It’s just a guideline. You can pick from 18 different languages, the letter every word can begin with, how many words the name will contain, miscellaneous names, and other factors, all of which are developed to help you formulate the most optimal business name possible for your company. You can also get a corresponding domain name through the site and check to see if it’s available. The business name generator, FreshBooks, is a great tool that assembles multiple recommendations. The tool produces company name suggestions associated with your niche and relevant to your field. 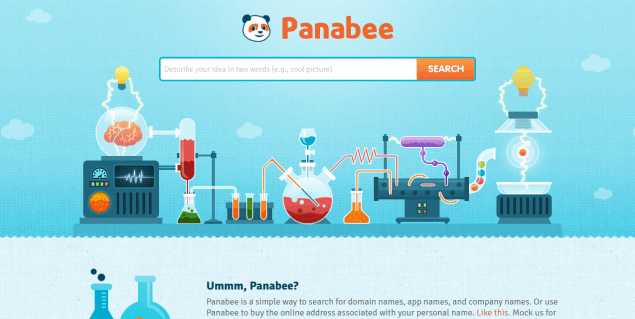 Panabee provides you with several different approaches to pick a proper company name. Begin with a couple of keywords, then view the results. You might be fortunate and get something immediately, but if you don’t, there are other options to broaden your search. This site can be used to find a domain name also, minimizing your searching tasks. Attempt to customize your list to look for various extensions, keyword variations, and compare recommendations via social networks to determine what is suitable and available. Attempt individual TLDs to make it location-specific. This article goes into more detail about business name generators. Stick to the name you end up going with. At some point in the start-up’s journey, the owner will be faced with an identity crisis: a change in marketing, product, strategy, awareness, or another factor. A name change, post-launch, will only result in chaos and confusion. While the company name should remain as is, feel free to alter your logo, branding, and strategy. Choose a brand name you like, one that adheres to all the qualifications mentioned earlier. The name should be a reminder of why you began the business and convey that excitement to your target market. How was your brand name chosen?